With breath taking views, you will want to return again and again. Take some time with family and friends to see what this region has to offer. 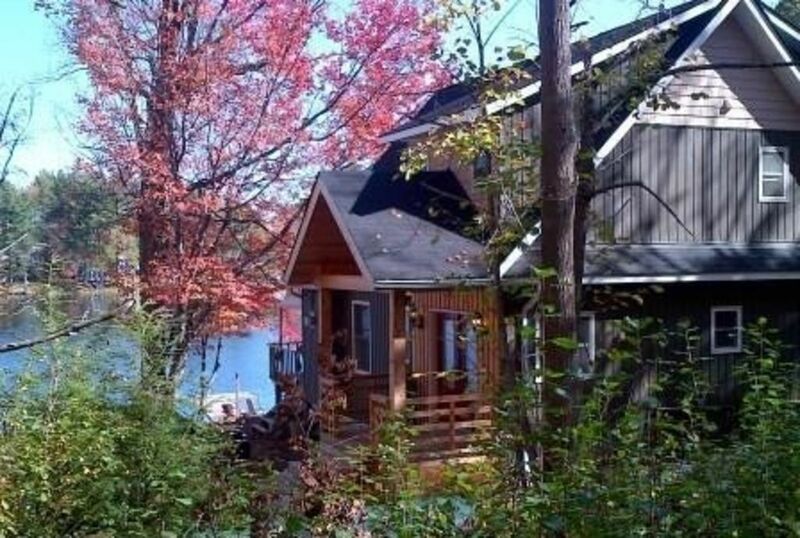 Our cottage is located in a prestigious and sought after area of Muskoka where it's available to enjoy all year round. Take your next relaxing getaway with us in Northern Ontario. In the winter our cottage is warm and cozy with 2 fireplaces and baseboard heating. In the summer you can sunbathe on our beach, stay cool in the shade or jump off the pier into freshwater. This Luxurious Muskoka waterfront cottage was built in 2013 and sits nestled on 4 very private acres, with 310 feet of waterfront. A retreat of modern and natural amenities awaits your time here. Visualize walking out a few steps to the shoreline, down a gentle slope to the water's edge. This beautiful find, has its own beach for everyone to enjoy. The wide sweeping sky, the clean relaxing waters, the rugged countryside, all waiting for your arrival. The cottage is a home away from home with 3 large bedrooms. The master bedroom has a king sized bed; the 2nd bedroom has a queen and the 3rd bedroom has twin over double bunk bed. There are 2 full bathrooms. The main floor bathroom has a tub/shower combo, complete with toilet and sink/vanity. The upstairs bathroom has a stand up shower stall complete with toilet and sink/vanity. The kitchen has nothing less than stainless steel upgraded appliances, with a dishwasher and over-the-range microwave for added convenience. We've thought of everything so you can enjoy life's little pleasures. There's a Coffee Maker, Kettle, Toaster, Plates, Cups, Cutlery and more. There is a Propane BBQ outside, along with a patio set and lounge area . The Lake is very private and quite, great for fishing and swimming (no big boats). We're situated between Port Carling and the town of Bala, Ontario with the wilds of nature at your doorstep while close to recreational activities all year round. My Muskoka Lakehouse is halfway between Port Carling and the Town of Bala. These 4 acres are nicely tucked away on Lake Ada. Being one of the smaller lakes of the region, the water is still, and calm. The trees provide shelter and privacy while the beach area to the East offers a perfect mix of sun and shade. Fall is one of the most picturesque seasons in Muskoka. There's still lot's to do in Winter like Snowshoeing, Cross-country Skiing, and if you enjoy snowmobiling, Trail C102D connects you to provincial trails. And of course there's the warmer months where there's not much you can't do with 310 feet of waterfront! Visit our website and share us! A $500 damage security deposit is required a day before checking along with the payment balance in full before cottage access is granted. We have 310 feet of waterfront just a few feet off the deck. Visa Credit, Mastercard - no charge. This deposit will be refunded if cancelled more than 21 days before arrival. If the booking is cancelled less than 21 days before arrival then a charge equal to 50% of the stay will be made. A $500 damage security deposit is required a day before checking along with the payment balance in full before cottage access is granted. Extra person fee of 90 per person per night after the first 8 guests.